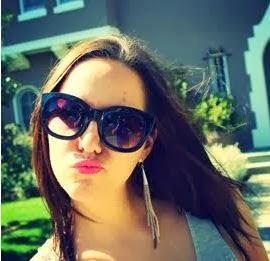 Hey, I have a new product to share with you! Well, not that new, but I just discovered it a few weeks ago and I wanted to try it before I told you about it. Back in September I shared my thoughts about Suave's New Dry Shampoo. I use dry shampoo pretty regularly, seeing how my olive complexion gets oily quick. 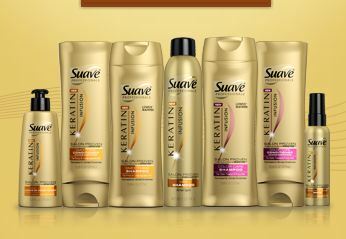 While perusing the beauty department at Target I notice that Suave has come out with a whole new line containing Keratin. Simply put, Keratin is a protein that restores and helps prevent damaged hair. My girlfriend got me to start using it about a year ago but it's really expensive. I was desperate to get my hair healthy again so I forked out the big bucks! So, getting to my point... I was really excited to see a budget brand introducing Keratin into their products for us Thrifty gals! 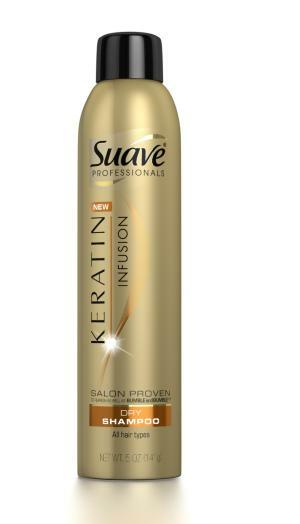 Since I knew that I loved Suave's original dry shampoo I had no doubts I would like the one with added Keratin. 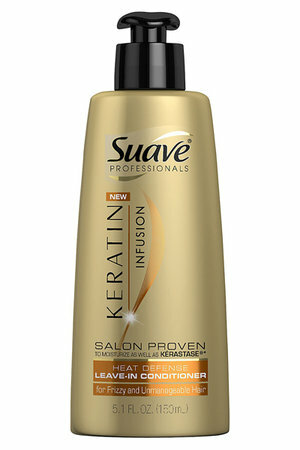 I also picked up Suave's leave-in conditioner with Keratin. Here is the whole collection. I am interested in trying all of these new products!! This is what the Dry Shampoo looks like! The scent is slightly different than the original one. This one smells kinda like hair spray, but not bad. I really like the way it works, it soaks up and prevents oil in my tresses. This is the Leave-In Conditioner and Heat Protector I picked up as well! I really love this product so far, it leaves my hair feeling super silky. I liked it so much I gave my bottle to my mom and went and bought me some more!! I believe everything in this line is under $5 (don't quote me). I know the two products I bought were both under $4 at Target. Thanks for the review! I love dry shampoo, I think I'm going to try this brand next!! i love their dry shampoo...i will have to try the keratin one. thanks!